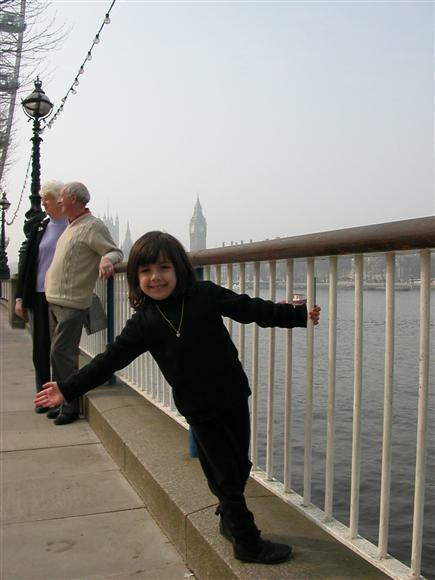 In March of 2003 we traveled to Paris, Bruges and London. Because of her love of "Madeline," it was around Paris that the trip was planned. Ellery never went far in Paris without her trusty backpack with its sketch pad, pencils, coloring sticks, camera and binoculars, all ofwhich were put to very good use. We arrived in Paris and shortly after checking into our little hotel, we started with the most important visit of all, to the Eiffel Tower. Ellery sat right down on the stairs behind the Trocadero and made her first sketch of the trip, a very good rendering of the Tower. After viewing the city from the top of the Eiffel Tower, we took a sunset trip on the Bateaux Parisiens to look for the bridge from which Madeline fell. Pretty sure she had spotted it, Ellery snapped a picture. The next day started at the Bois de Bologne. Then it was off to the Hotel National des Invalides, looking for wounded soldiers. Fortunately, everyone there seemed healthy. The next stop was the Rodin Museum. This was one of Ellery's favorite places in Paris, and we spent much time here studying the sculptures. Ellery decided to draw several of them, including The Thinker and one Ellery dubbed "the flying woman." That afternoon, we were off to the Cimetiere du Pere-Lachaise, seeking the final resting place of the rich and famous. Alas, we could not find Oscar Wilde, despite a long search. Our third day started at teh Tuileries, looking foro the view of the Louvre that Madeline had. It was a bit chillier than we had anticipated. Of course, when we got to the Louvre, there was something there that Madeline had never seen -- a huge glass pyramid. Is Mona Lisa smiling at the change? After lunch at the tres chic Angelina cafe, we went walking. First, it was the Place Vendome. We didn't find any thieves, but we did find the police! We continued walking until we found the Opera Garnier, and decided to go inside. We were impressed by Chagall's ceiling, but Ellery thought she could improve on the design. After the Opera, we took the metro (as we did throughout our trip) to the Musee de la Poupee, the Doll Museum. This day found us on the bridge to the Institut de France, where Ellery carried Madeline just as Ms. Clavell had done. Then on to the Ile de la Cite, where our first visit was to Sainte Chapelle. From Sante Chapelle, it was only a few steps to Notre Dame. While Ellery wasn't impressed with the exterior, she was entralled by the inside. Many drawings were made of the beautiful glass windows. Then it was lunch at teh fashionable Deux Magots Cafe on the Left Bank. On to the Jardin du Luxembourg for a bit of play, including a pony ride. The day then ended at the Musee National du Moyen Age Theermes et Hotel de Cluny to see the tapestries of the Lady and her Unicorn. Day 5 was spent at Versailles, which netted just one photo by Ellery. But we had a great time both inside and out, exploring the huge gardens and lunching at the canal. Our last day in Paris took us to Montmartre where we began the day at Sacre Couer. As at Notre Dame, Ellery found plenty to see and draw before heading down to the Marche aux Puces. After Montmartre, we paid a visit to the Picasso Museum and then made our way to the train station, saying au revoir to Paris ... for now. We took the train to Brussels, but didn't spend any time here, because we were off to our next stop. Another train ride later, and we found ourselves in the wonderful little town of Brugges. We walked around a bit and had dinner before calling it a day. This was an action-packed day, involving lots of walking around the town, a carriage ride and a boat trip through the town's many canals. Day 8 took us back through Brussels on our way to London.